Test Plugs & Gas Bags ..
Thaxton® Pipe Stoppers – precision machined, case hardened. Wing Nut Test Plugs – cast iron. Logiball® Multisize Plugs – reinforced rubber. Cherne® Test Plugs – Test Ball® Plugs and Muni-Ball® Plugs. Lansas® Plugs, Balls, Domehead and Flowthru or Leak Locator Plugs. 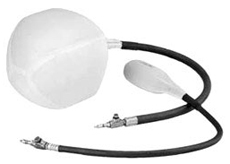 Low pressure Inflatable Gas Bags. Designed to inflate to the exact diameter of the pipe to block dangerous fumes or gases from coming forward during repair of an active pipeline. Varying gauges of rubber and polyester depending on the size. Optional flame retardant cover and nitrile rubber bladder.